- Book Condition: USED/Acceptable. Medium to heavy wear on cover. Stain marks on sleeves but beige pages clean no writings.. Book is thick in width with 1472 pages. 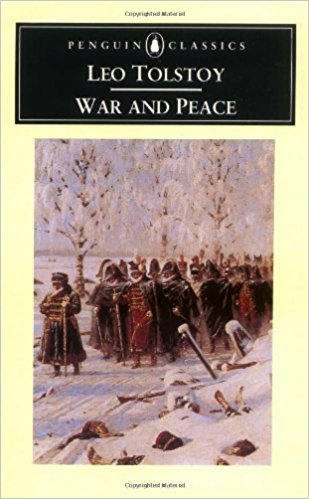 Few would dispute the claim of "War and Peace" to be regarded as the greatest novel in any language. This massive chronicle, to which Leo Tolstoy (1828-1910) devoted five whole years shortly after his marriage, portrays Russian family life during and after the Napoleonic war. Tolstoy's faith in life and his piercing insight lend universality to a work which holds the mirror up to nature as truly as those of Shakespeare or Homer. Epic historical novel by Leo Tolstoy, originally published as Voyna i mir in 1865-69. This panoramic study of early 19th-century Russian society, noted for its mastery of realistic detail and variety of psychological analysis, is generally regarded as one of the world's greatest novels. War and Peace is primarily concerned with the histories of five aristocratic families--particularly the Bezukhovs, the Bolkonskys, and the Rostovs--the members of which are portrayed against a vivid background of Russian social life during the war against Napoleon (1805-14).